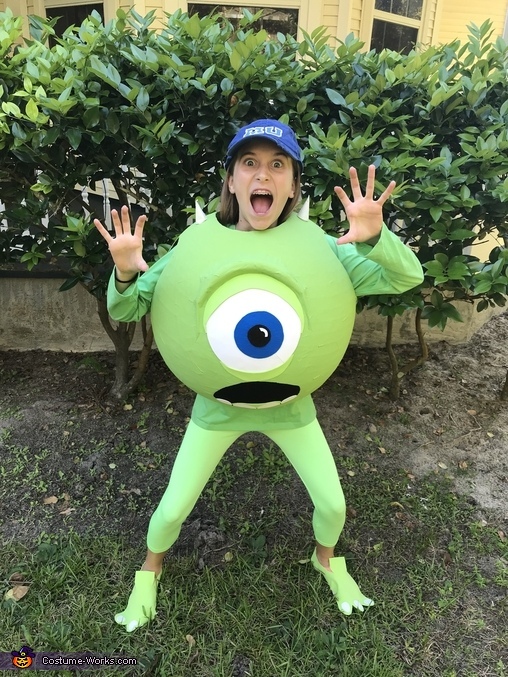 This is a picture of our 12 year old daughter who wanted to be Mike Wazowski from the movie, Monsters Inc. She wanted something original. Her father made the costume. He decided to use a large exercise ball and paper maiche it. After many layers, he carved a small foam roll and applied to to make the eyelid. Remainder of project included painting, using felt and foam to make the remaining eye and mouth. He then cut holes for her head and arms. We used remaining green foam and glued it on her shoes to create monster feet!